Over the next month, we at IDA will be introducing our community to the filmmakers whose work is represented in the DocuWeeksTM Theatrical Documentary Showcase, which runs from August 12 through September 1 in New York City and August 19 through September 8 in Los Angeles. We asked the filmmakers to share the stories behind their films--the inspirations, the challenges and obstacles, the goals and objectives, the reactions to their films so far. So, to continue this series of conversations, here is Robert James, director/producer, with Ondi Timoner, of Library of Dust. 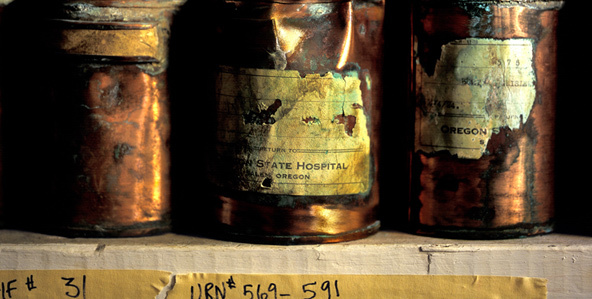 Synopsis: Thousands of corroded copper urns containing the cremated remains of unclaimed psychiatric patients were discovered in 2004. A tour of the Oregon State Hospital involving the local press and a state senator was conducted to uncover the deplorable conditions of the hospital. What they didn't expect to find was a storeroom full of human ashes dating back to the late 1800s. Photos are taken of the mysterious corrosive effect on the canisters, and several histories of these forgotten souls are revealed in this unique tale. Robert James: I took a few film classes at City College in San Francisco as a mid-life career change after making travel videos and discovering IMovie on my Apple for editing. After two semesters I saw DIG!, Ondi Timoner's award-winning doc, and was so inspired by the edginess of it that I contacted her on Facebook. We eventually met, I traveled the world with her and assisted on her film at the time and then pitched the idea of Library of Dust to her while doing shots of Mezcal in Oaxaca, Mexico. She agreed, and we made it. IDA: What inspired you to make Library of Dust? RJ: The Oregon State Hospital was constantly changing staff, and at one point a new PR staff member called me during our shoot and told me we couldn't shoot any of the hospital exteriors. At that moment we were shooting an interview using an exterior background; I just told her, "Okay." Also, getting the senator, who is pivotal in our film, was a challenge. We didn't know we were actually going to get his interview until about two hours before we did it. I had a daily heart attack leading up to his final consent. RJ: Like all, or at least many, documentaries, the story takes different courses as you meet new people. In pre-production we thought Maisel's personal story of the canister discovery was very important. As we moved forward, his story became more and more diminished. During production we got involved with stories of current and past hospital staff and patients. As we got to post, we didn't end up using much of that footage. While shooting I was very interested in filming the crematorium. My co-director couldn't see the need; we ended up opening our film with that footage. IDA: As you've screened Library of Dust--whether on the festival circuit, or in screening rooms, or in living rooms--how have audiences reacted to the film? What has been most surprising or unexpected about their reactions? RJ: People seem moved by it, but more from the mysteries of our story than an emotional response. We were worried about our beginning, which showed an actual cremation, and how people would react. Everyone has loved it and we are so pleased, since we do too. I am most surprised when people shrug their shoulders and say "Eh...." and have no reaction. RJ: My co-director, Ondi Timoner, changed my idea of what a doc could be by showing that docs can be thrilling. I also love Amy Berg. Deliver Us From Evil chilled me to the bone. My current favorite directors are Seth Gordon, who made King of Kong: A Fist Full of Quarters, and Michael Stephensen, who made The Best Worst Movie. Both showed that any tiny subject, whether it be a video game competition or an homage to a bad film, can be entertaining if the right person tells the story--especially if the subject is one you couldn't care less about, but you end up caring about due to the filmmaking. Library of Dust will be screening August 19 through 26 at the Laemmle Sunset 5 in Los Angeles. To purchase tickets for Library of Dust and the rest of the films in the DocuWeeks Los Angeles Shorts Program, click here.